Flora is set to become 100% plant-based as it gets set to relaunch its product range with a range of dairy-free products certified by the Vegan Society. 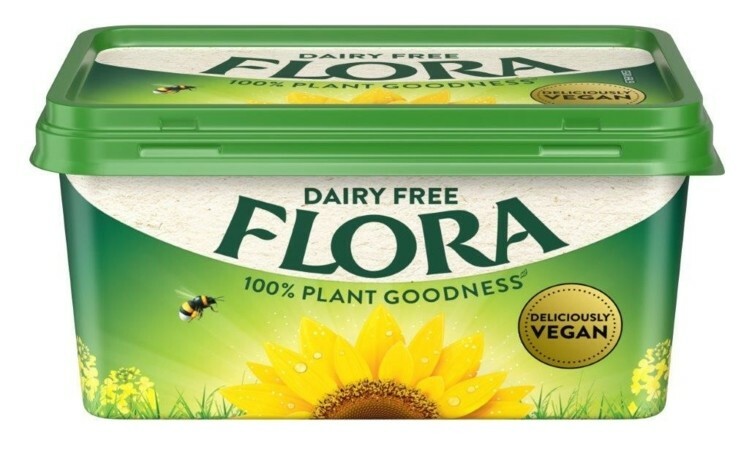 In a bid to tap into the growing consumer trend of ditching the dairy and choosing animal-free products instead, Unilever launched Flora Freedom as part of their “Powered by Plants” campaign in 2016 before adding more dairy-free offerings to the range with the launch of a trio of plant-based spreads. Now Flora (who are no longer owned by Unilever) is set to become 100% plant-based as it gets set to relaunch its product range, including rolling out its dairy-free variant to caterers. The products have also been certified by the Vegan Society to make it easy for shoppers to identify the products as suitable for vegans. The company has removed dairy from its entire range of products, including Flora Original, Flora Light, Flora Buttery, and Flora Dairy Free. The launch is being supported by new packaging and a TV advert airing later this year. Speaking about the decision to offer the 3.5million consumers in the UK who identify as vegan plenty of choice, Steven Hermiston, Upeld general manager for UK and Ireland, said: “Health and wellbeing has never been so important to consumers. People now care more about what goes into the products they are feeding themselves and their families, but they are not prepared to compromise on taste – and they should not have to.